Guatemala. Variously known as ‘land of eternal spring’ and ‘place of many trees,’ this exceptional country has a great heartbreak. It’s home to more than 340,000 orphaned and abandoned children: innocent victims of extreme poverty. Yet there is hope. We invite you to be a part of this hope by volunteering abroad in Guatemala, with a very special project. Project Somos is, at heart, a Children’s Village: seven homes, seven moms, 49 children. Land has been purchased and construction is finally underway. Organic agriculture will be a part of the Village and will provide food for the moms and children. The children will attend the local community school and their education will be augmented by music, art and leadership. Working side by side with local workers and families, you will have the cultural exchange experience of a lifetime. You will never be the same and you know it. In fact, you will be a part of changing the lives of everyone involved. Will you risk it? Will you grow? Will you go? At heart, you are probably a compassion warrior. Perhaps we all are. But it is only when you take that step, that you find out all that it means. We are not a charity, we are a business. We recognize that you are here, in part, because you need a holiday. So we have designed this volunteer package to include your home comforts. All you have to do is be a part of the creation of this home for abandoned children and their extraordinary new moms. 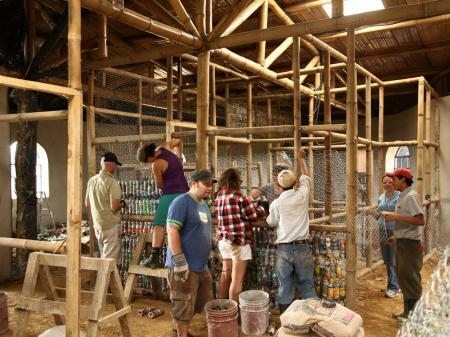 Approximately 28% of the tour cost goes directly to Project Somos for materials and labour. You get a break and return home refreshed in ways you did not think possible: a true renewal in your compassionate heart, for the children of Guatemala.